Just like the seasons, transition from painting colorful fall foliage to the subtle nuanced colors of winter. 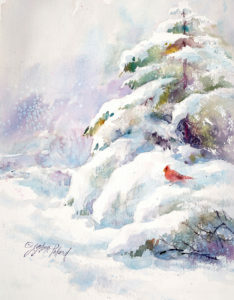 We will explore watercolor techniques suited to placing trees with character and personality into our landscapes and even some “holiday” snow! A photo will be provided for your use but you are always welcome and encouraged to paint from your own reference material whenever you wish. There will be demonstrations of techniques suitable for the subject, exercises, ongoing critique and lots of painting time. Class time will be structured, yet open enough to accommodate the artistic spirit within us all. All levels are welcome and encouraged to attend. The only prerequisite is an attitude of joy in the act of painting!